Jeffrey Anvinson has been active as a performer, educator, arranger, conductor, music transcriber, writer, music critic, arranger, composer, music engraver, recording artist and producer (both sides of the microphone), video producer, and business owner for more than thirty-five years. He has performed classical, jazz, pop, rock, blues, musical theater, country, religious music, and bluegrass on radio, television, and other venues as a soloist and in numerous ensembles in the United States, China, and Canada. 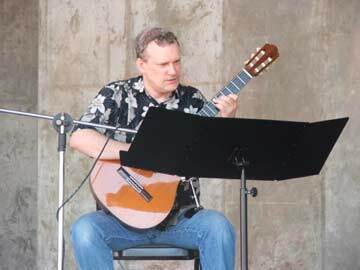 He has taught more than 24,000 individual music lessons (guitar, piano, and more) and 160 sections of courses on a variety of guitar and music theory subjects in a wide variety of settings, including universities, commercial businesses, and public schools. He has published twenty reviews and articles and has recorded numerous times. He grew up in rural Minnesota and studied music at several universities, including the University of Minnesota in Minneapolis and Montana State University, eventually earning two degrees in music and a certificate in management and supervision. He owns and operates JLA Music, a company that provides lessons in guitar, piano, music theory, arranging, composition, music technology, and other music subjects. His website, www.emahle.com, distributes and promotes the guitar music of Brazilian composer Ernst Mahle. He started playing piano when he was six years old and guitar when he was fourteen. He learned many other instruments as well, including voice, though he now focuses on guitar and piano.